STAMFORD KO SHIELD: Raheel on the rampage as King’s Keys oust holders. 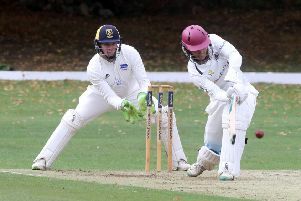 Mohammed Raheel whacked 59 not out for King's Keys against Ketton. A mighty all-round performance from Mohammed Raheel set up a shock 20-run Stamford KO Shield semi-final win for King’s Keys over Ketton at Pit Lane tonight (July 7). Raheel first marched to the crease with the city side floundering at 53-5, but he blazed two sixes and nine fours in an innings of 59 not out to push his side up to 152-9 in their 20 overs. That was harsh on Dan Cotton who returned outstanding figures of 3-7 from his five overs. No-one else in the King’s Keys side reached 20. But Raheel wasn’t finished. He claimed 4-18 with the ball as Ketton, the holders, were dismissed for 132 in reply. The Lions’ innings rather petered away once dangerman Zeeshan Manzoor was dismissed for 42, inevitably by Raheel. King’s Keys now play hot favourites Bourne in the final at Market Deeping on Monday (July 10, 6.15pm). Ketton 132 (Z. Manzoor 42, S. Mahmood 24, M. Raheel 4-18, S. Choudhary 2-21, F. Javed 2-32).